The Legendary Lights of Clifton Mill wins $50,000 prize on ABC's "The Great Christmas Light Fight" TV show. The Legendary Lights of Clifton Mill Wins Top Prize in The Great Christmas Light Fight! The Legendary Lights of Clifton Mill, a Christmas Holiday tradition for over three decades was highlighted on ABC TV’S ‘THE GREAT CHRISTMAS LIGHT FIGHT’ Monday evening, December 3, 8-9pm winning top honors as best Christmas Lights in the Heavyweight Division. “We couldn’t be more excited that judge Carter Oosterhouse and ABC picked us to be featured on their show. And even more gratifying we took home the trophy and top prize.” said Anthony Satariano, co-owner of Clifton Mill. The TV crew of over a dozen camera & boom operators, sound & video techs, and producers were here over Thanksgiving last year. “It was a big deal for our little town of Clifton and Greene County. We were all sworn to secrecy until now.” He added. “Folks around here know about the Legendary Lights of Clifton Mill, now we have this opportunity to share the fun, excitement and wonder with the entire nation.” And we couldn’t have done this without the help of our remarkable staff. They are truly the best.” said Jessica Noes, General Manager of Clifton Mill. The broadcast repeats Saturday night December 15. Check local listings. The Legendary Lights of Clifton Mill is an outdoor event and weather permitting. Call beforehand. Admission is $10 per person for everyone age 7 and older. Concession Food is available. BEST TIME TO VISIT IS MONDAY THROUGH THURSDAY. Clifton is in Greene County, Ohio three miles east of Yellow Springs on State Rt. 343, six miles south of Springfield on State Rt. 72, and three miles north of Cedarville on Rt. 72. 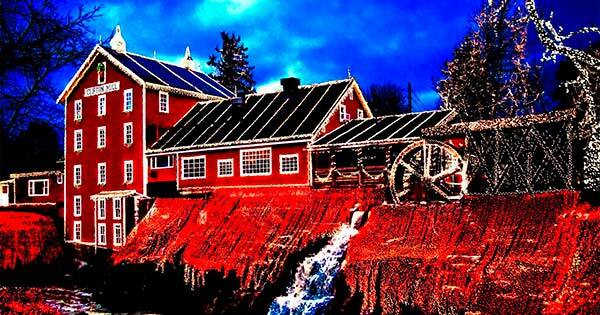 Find more events like "Clifton Mill Christmas Lights Win National TV Contest"